I recently had an e-mail exchange with Dave Bruno, who used to have a website dedicated to the Sinn 142 model (with Lemania 5100 movement), and he wrote “now I’m on a Seiko kick (recently purchased the SBGE001….my grail !)”. The SBGE001 is a GMT watch of the Grand Seiko range. 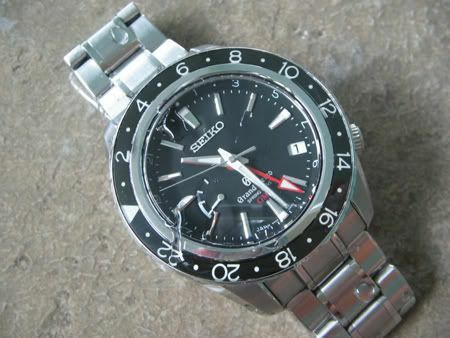 The top of the bill watch line of Seiko. Until recently, the Grand Seiko was something you wouldn’t see outside of Asia. When Seiko introduced their spring drive technology, they start to market it world wide. The SBGE001 is a 44mm diameter watch and has a 14.7mm thick case. It weighs 177 grams, wow! What does it offer for almost 3500 euro (approx 5350 USD)? Dual timezone, 72 hour power reserve and 20 atm water resistant. Maybe even more important, a very well built quality watch. I wonder if watch collectors are ready to spend 3500 euro on a Japanese watch. 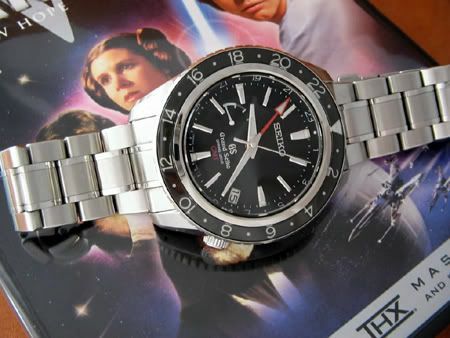 Looking at the pictures that various people have put on the internet and reading the reviews written by Seiko enthusiasts, I am starting to think that the avid watch collectors may add a Seiko Spring Drive to their collection sooner as I thought. I have handled the first Spring Drive Seikos at an authorized dealer when they got introduced here in The Netherlands, and I was quite impressed. Only the price set me back from thinking that collectors would be jumping into the Spring Drive. Dave wrote me that he compared it to the Rolex GMT-Master II, and that it was no comparison in favor of the Grand Seiko SBGE001. That makes me curious about this watch. And curious about its movement, caliber 9R66. I haven’t seen pictures of the Seiko Spring Drive movement that’s inside this watch. What do you think? Would you add a 3500 Euro Grand Seiko to your collection if the same money would buy you a nice Swiss watch with the same functionality? Even if the Seiko would be better crafted (bracelet, case etc)?